I no the answere I juts cant explain in words. It's not the same 3-D object as we see it in the photograph. It's built flat, with boards laid on top of one another. Photographs are 2 dimensional, and that adds to the illusion. look at it if you were looking at the blue wall cube then look at the corner like if it was the book illusion does that make sense? i think that is too weird. 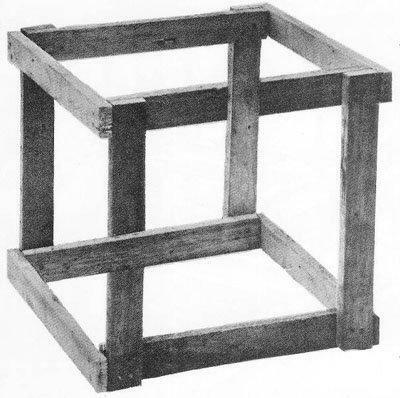 Crazy crate is for carrying widgets and other undecidable objects.